Delivering a lively presentation that can be used on a variety of applications, the Reaction Innovations Man Bear Pig offers a creature bait inspired twist on the original Sweet Beaver. The Man Bear Pig features Reaction Innovations’ signature forward facing ribs, which create pressure waves throughout the water to alert bass that something is moving in their strike zone. It is also molded with two small, thin upper legs, two longer, wide appendages, and two ribbon tails, which individually produce different lifelike actions that help it resemble a wide range of bass forage species. The Man Bear Pig is ideal for flipping and its body can easily accommodate a large straight shank flipping hook. It also excels as a jig trailer, on a Carolina-rig, and on a shaky head as well. Made from a secret blend of flexible and tough plastic that is loaded with salt, the Man Bear Pig provides a natural taste that makes bass hold on longer so you have more time to set the hook. 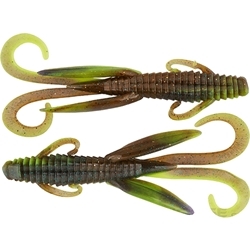 Available in a wide range of custom color ways that have made Reaction Innovations a staple among avid bass anglers, the Reaction Innovations Man Bear Pig is another fine addition from one of the premier soft plastic companies.